High quality colorful manicure brushes. 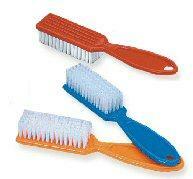 Firm bristles and thick, strong plastic handles. Thick, soft bristles with comfortable wooden handle. Ideal for cleaning excess acrylic powder, dusting nails and counter tops, and cleaning hair around neck and face. Sleek and attractive seashell shaped manicure bowl. Extra deep and perfectly shaped to allow hand to rest comfortably while soaking. Stackable and made of durable hard plastic to withstand any solutions. Stripping brushes uniquely designed for the finest detailing tasks: nails, models, dolls, decorative paintings, graphic designs and more where delicate strokes and touches are required. Three (short, medium, and long) brushes with color-coded handles. This unique space-saving tool is designed to help you create professional nail art the easy way. The curve shape of the brush gives you a unique angle that enables you to see your artwork as you go. The versatile dotting tool not only create dots but also marbleizing effects. Great for displaying nail polish colors and nail art designs. Each package comes with 2 wheels (natural) and 2 labels. Each wheel, 4.75" diameter, has 18 tips. 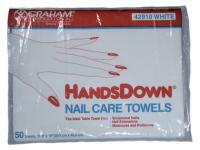 Great for soaking and removing artificial nails. Durable, reusable, acetone-safe. Each package comes with 2 soaking trays. Each tray molded with 5 finger wells. 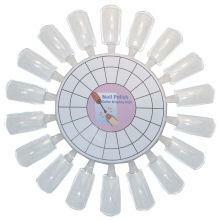 Add your favorite soaking solution to finger wells and insert fingers. No need to soak the entire hand. Use it with airbrush color, primer or any liquids in Dappen Dishes, bottles, etc. Ideal for transferring any liquid from your bottle to dappen dish without the risk of spillage and over exposure. Lint-free. Strong and absorbent. Easy dispensing. Great for gel nails. Soft, absorbent, hypoallergenic and virtually lint-free. Features an embossed tab that can be held securely between the thumb and forefinger for easy gripping and a protective barrier that shields fingers from coming in contact with skin-irritating polish removers. Made from a unique non-woven fabric, HandsDown towels are soft, strong, absorbent, lint-free and thick enough to protect the work surface. The textured towel surface is ideal for gel nails, nail art, and cleaning brushes. Perfect for removing soak-off gel polish and acrylic. The flexible design is perfect for finger and toe nails. These wraps are easy to apply without wasting acetone on a full soak. 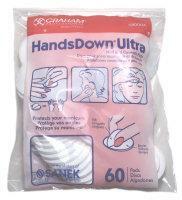 Can be used during any polish or acrylic nail removal. The comfortable material is easy to wrap and stays put. Users can easily page through magazines or books while wearing these wraps. 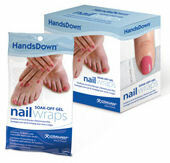 Use these wraps to remove soak-off gel polish, glitter, acrylics or any other stubborn dark polishes. Thick, absorbent, and strong - perfect all-purpose towel, sized for maximum coverage to wipe perm solutions and spills. Made from recycled paper. Huck Finish. The Brush Cleaner jar can hold up to eight brushes at various sizes and can be used with all brands of brush cleaning solution. Comes with a screw on lid to prevent evaporation of brush cleaning solution when not in use. Made from high grade wood, these smooth finish quality wood cuticle pushers are hard but flexible enough to push back cuticle with both flat ends. 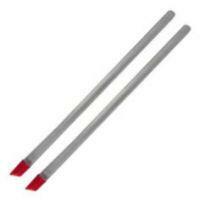 Made of clear plastic with a flat on one end and a 45 degree angle (red tip) on the other end. 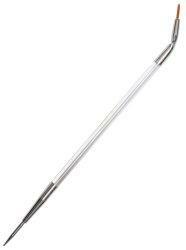 Use the flat side to push back cuticle and the 45 degree angle to push, smooth, and remove any dead skin cells. Excellent tool for controlling and resting your client’s finger while performing airbrushing and nail art detailing. One-way support tilter holds a polish bottle at any angle. One size fits all nail polish bottle. Three-way support tilter holds a polish bottle at any angle. One size fits all nail polish bottle. Made of hard plastic with nail tip, this reusable practice finger is an indispensable tool for practicing airbrushing, nail art detailing, acrylic, gel, and wrap. Made of hard plastic, this reusable practice finger is an indispensable tool for practicing airbrushing, nail art detailing, acrylic, gel, and wrap. 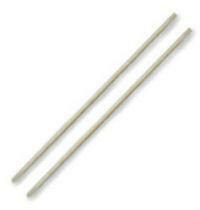 Artificial nail tip can be mounted onto the practice finger. A life size reusable hand for practice of all types of nail applications - airbrush, nail art, acrylic, gel, and wrap. Artificial nail tips can be mounted onto the fingers. Medical or dental quality disposable ear loop mask. Three-ply pleated design offers filtration at greater than 95%. Nail Edge assist guides for the ultimate french manicure. Contains 156 half-moon self adhesive nail guides (12 sheets) and instructions booklet.